When you walk into B&B Classic Dogs in Bellevue you’re going to have to make a decision as to where you will allow your attention to be pulled. Will you want to stop and savor the smell of the food? Will you want to allow your gaze to wander over to the menu on the wall, or will you instead get caught up in the bright lights and loud noises of the arcade in the back of the restaurant? Will you be able to disregard all these sensory events and boldly stride to the counter, confidently ordering a hot dog? Calm down. It’s not meant to be stressful. Opened last year, B&B Classic Dogs can be summed up in one word: fun. 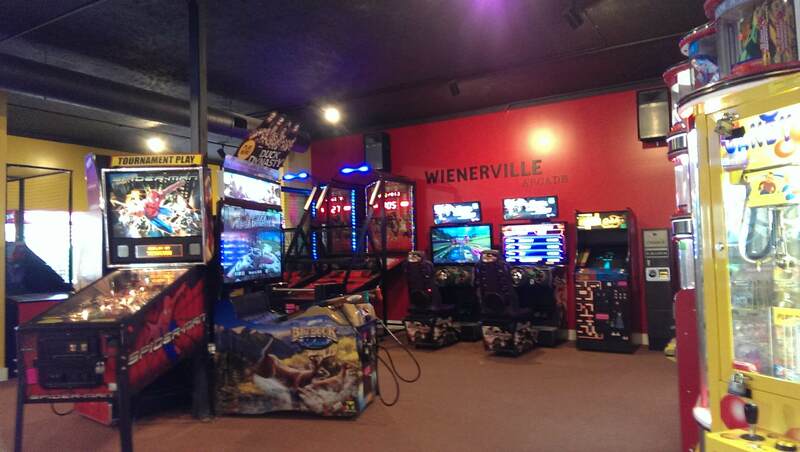 I mean, hot dogs are fun and arcades are fun, so put them both together in one place, and it’s a fun explosion. There’s a lot more to this place than that, though. The food is actually good, even though most places with arcades can get away with less than stellar food since kids still want to go there to play games. This place doesn’t try to pass off mediocre hot dogs. Instead, all their hot dogs are all-beef Nathan’s hot dogs and come in a wide variety that makes both kids and adults happy. I visited with my kids, and although it took me a while to get them to walk away from the arcade, when they did finally sit down and eat they were happy with their plain hot dogs and French fries. “Uh-huh,” my son answered. “Can I have more quarters for the arcade now?” If you’ve never spent any time with an eight year old, then you probably don’t realize that this is indeed a shining endorsement of the food. To be truthful, I kind of wanted to order the “PBB,” which features peanut butter and bacon, but that was only so I could say I’d eaten it. So I instead went with the Chicago Dog, which has a pretty traditional set of toppings including mustard, green relish, onion, tomato, pickle and peppers on a poppy seed bun. It was tasty; the hot dog was big and juicy and the toppings were fresh. My fries were good too, and I could tell they had just been cooked. You get to choose the size of your hot dog. I had the 1/4 lb hot dog, but from what I understand there’s a 2-foot option. Now I don’t know what’s going on in your life if you need to attack a 2-foot hot dog, but I’m not judging. There are plenty of other options too. If you don’t like hot dogs, order one of the menu items with something else like chicken or a Portobello mushroom. The next time I visit, I think I’ll try one of their hot dogs featuring cream cheese because I like cream cheese, I like hot dogs, and therefore it’s a logical next step to try the two together. There’s a friendly atmosphere at B&B Classic Dogs. I could tell that many of the people who visit this place do so frequently, as they all seem to know Diane, who is one of the owners. When I briefly chatted with Diane she told me that opening the restaurant was a real dream come true. I could tell she was having a good time as she went from table to table checking on everyone. Simply put, this is a fun, casual place that serves good food. Just be sure to bring some money for the arcade if you’re bringing kids. Don’t say I didn’t warn you.